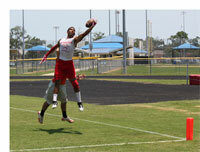 The Red & Black Sports Club hosted a 7 on 7 “Battle By The Beach” Football Tournament in 2011 and 2012 at the New Smyrna Beach Sports Complex in New Smyrna Beach, Florida. The tournament included over 30 football teams from across the state of Florida that encompassed the best athletes in their age group. The Tournament had over 1,000 participants that drew over 2,000 attendees. The Tournament had a top prize of $10,000 for the first place team and $5,000 for the second place team. In addition to raising funds for youth area sports, this event brought friends and families from around the state that support local business through lodging reservations, and restaurant patronage. The Tournament was two days long with dozens of high quality elimination games. Booker T. Washington from Miami, Florida won both tournaments.